3.3 out of 5 based on 29 bloggers and 1 commenters. 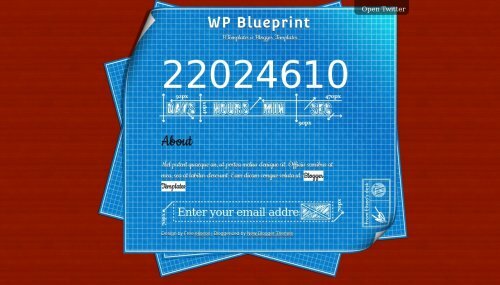 WP Blueprint is a free blogger template adapted from WordPress with 1 column, social bookmarking icons and geometric motifs. Excellent template for blogs about science. You need to know, “coming soon” Blogger template is useless. Does no like wordpress, you cannot maintenance your Blog while you’re using the similar template like this one. Try to create a unique Blogger template rather that just convert from wordpress.